Cologne - An unwanted defensive record for Borussia Dortmund, a landmark victory for Borussia Mönchengladbach and a club record for Bayer 04 Leverkusen: Matchday 33 threw up another bucketload of interesting stats. 6 - There were six home wins this weekend, with only Matchdays 13 and 23 (both seven) producing more victories for sides playing on their own patch. 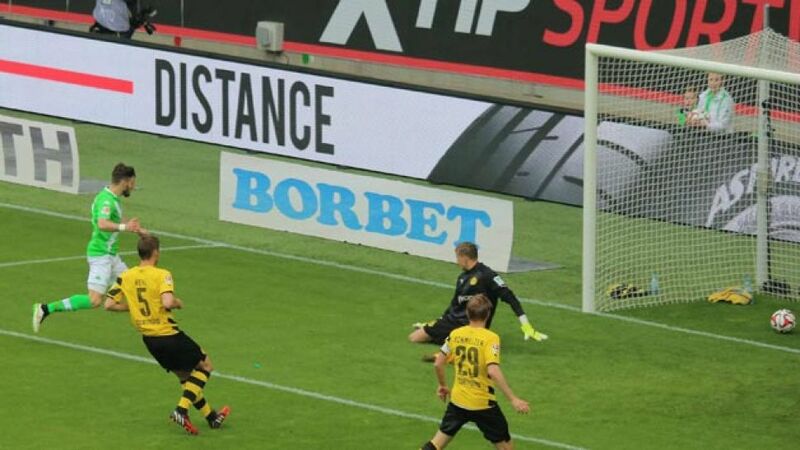 19 - Just 19 goals were scored on Matchday 33, with only Matchdays 6 and 19 producing less goals. 13 - Gladbach are now unbeaten in the Bundesliga in 13 games. The last time they managed that was 33 years ago when Jupp Heynckes was coach. 100 - In his 100th Bundesliga appearance, Augsburg skipper Paul Verhaegh scored a penalty before being sent off. 6 - Leverkusen’s 2-0 home win over TSG 1899 Hoffenheim ensured that the hosts kept a sixth straight clean sheet in the Bundesliga, which is a new club record. 135 - Leverkusen’s Stefan Kießling now has 135 Bundesliga goals. He needs just one more to move level with legendary Hamburg frontman Horst Hrubesch and into joint-18th place on the list of all-time Bundesliga goalscorers. 4 - Bayer, who can only finish 4th this season, will have to negotiate a qualifying round to the reach the UEFA Champions League group stage for a fifth time. They have been successful in all four of their previous attempts. 19 - In losing 1-0 to FC Schalke 04, SC Paderborn 07 conceded in the final quarter of an hour for the 19th time this season, a league high. 12 - Paderborn also failed to score away from home for the 12th time this season, equalling the records of FC Energie Cottbus in 2001/02, SG Dynamo Dresden in 1991/92 and Rot-Weiß Oberhausen in 1971/72. 2011 For the first time since February 2011, Bayern were beaten in the Bundesliga despite having scored the first goal. 5 - After their 2-0 defeat at the Coface Arena, 1. FC Köln have played five away games at 1. FSV Mainz 05 in the Bundesliga and lost all of them. The 05ers are the only club currently in the top flight against whom the Billy Goats are pointless away from home. Additionally, this was the fifth straight away game in which Köln have failed to score, equalling a club record. 14 - BVB suffered their 14th defeat of the campaign against Wolfsburg, more than they lost in the last two seasons combined. 1 - Eintracht Frankfurt kept a clean sheet away from home for the first time all season in their goalless draw at Hertha Berlin.